Ex Hot Girl: I am not a terrorist. You can probably get away with flying in that now, but I few years ago you might have gotten strip searched because of it. Love that t-shirt! Yeah the security guards have chucked me out of places too - grrr! Oh, and as for airport security, there must be something about me that looks shifty (or the fact that the fat rolls look like I am concealing something under my clothes), but I always get searched - more grrrrs! 1. How do you like Zumba- my super fit boss is taking a class and likes it, but I wanted to know what you thought of it. 2. What kind of camera do you use. I love photography, and am looking to invest in a SLR in the near future. Ok, I seriously LOVE the shirt! Where did you manage to find that? I was doing a time-related sequence shoot for school near the airport last year and was "heckled" by some unfriendly police officers, so I feel your pain. 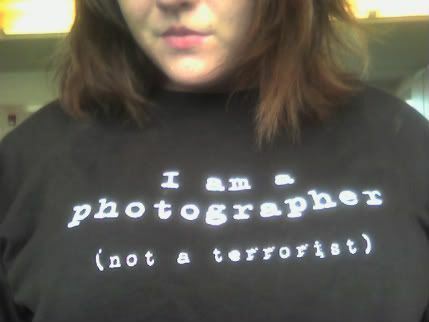 I wore it while receiving a photography award for a local magazine - people thought it was hilarious! I love that shirt! I'm an amateur and it drives me crazy when I'm told I can't take pictures places. I'm not planning on bombing the place! Come on!